So it’s the weekend again, or almost. Thursday nights are sometimes a flurry of finishing-up-work, running errands to pick up trail chow and packing for a weekend backpacking trip. Is it only 8:20? Somehow I managed to run nearly seven miles after work today, followed up by tea-and-a-hot-bath, so it feels later than it actually is. I’m still processing the photos from the last hiking excursion I made back to Glacier View in early October. I’m ready to search out more compositions for my lens. I’m ready to spend an extended period of time with adults. I’m ready to be quiet and not in charge. I’m ready to take a break from speaking in German. Weekend, come quickly. 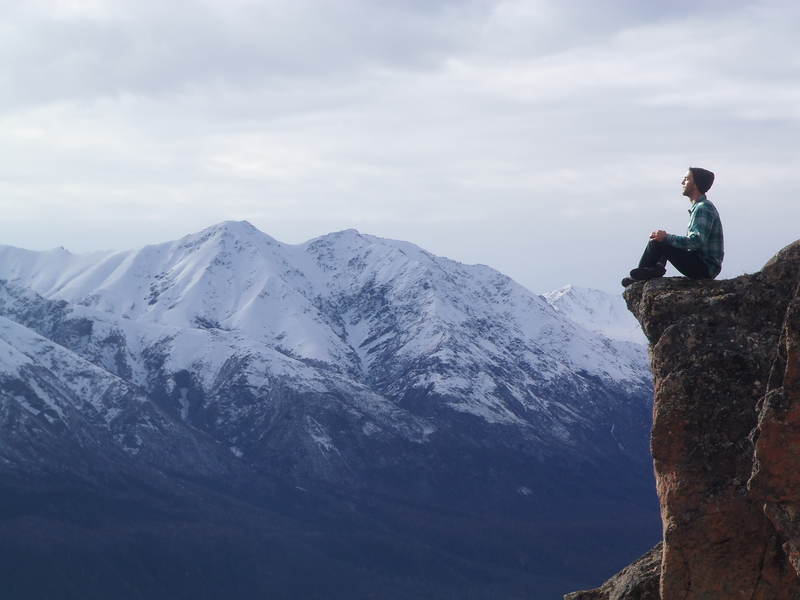 The last weekend trip I made with a friend brought me to a ridge line edged by sheer cliffs overlooking the Matanuska River valley, and facing a series of peaks to the southeast. I was invited by a local whom I had met at a rock climbing festival earlier in the year, who was sorely disappointed that I had not brought along my climbing gear. He showed me a couple of bouldering locations he’d been working on and hoped to improve by cleaning out the moss, lichen, and bits of earth wedged deep in the cracks of the massive stone. I can’t say I’m drawn to bouldering, but I haven’t done it much. I suppose the idea of one bad fall splintering my spinal column is enough to turn me off. Unlike rock climbing with a belay partner, the safety features of bouldering involves only fall cushions and spotting partners. Kind of gives me the willies. Maybe I just haven’t found the right rock to grapple with yet. With only about five hours to spare, we hiked quickly, making time for photography as much as possible, taking breaks for tea and coffee, and calling the dog away from every edge. 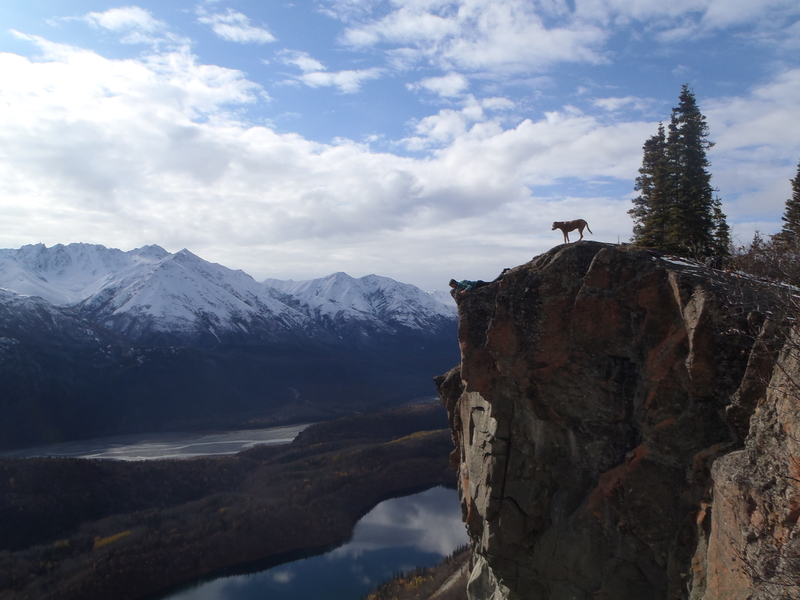 A curious animal with an uncanny aptitude for the epic dog pose, Taco braved every ledge and scraped his way up all the scree, and finally bloodied his paw on a sharp stone which cut into the skin around a front claw. Rather than whining, he struck the Noble Hound pose and waited patiently to be tended. Snow lay in soft heaps among mint-green lichen, grasses, and alder scrub. Rocky outcroppings, mottled sandy red, tan, grey and ashy black, jutted up out of the earth, bare, with straggling roots of stumpy, windblown spruce gripping a hold through the the thin soil. A pale sky lay white against white mountain peaks, which teased the photographer in me, surrounded as I was with a riveting composition– vertical drop-offs, crags, dihedral insets and the vista across the valley, but the colors melded together in a dark huddle against the overexposure of a bright white sky. The golds and ambers of autumn were not yet spent, and the bright green birch leaves still fluttered despite the first frosts of October, but I could not catch the colors that day. Instead, I experimented with depth of field and vertigo. We threw a few rocks off the cliffs and watched them fall. I imagined what our bodies would sound like slamming against those rocks. In the shot I liked best from that day, I caught my buddy poised on the edge of a rock, facing out towards the mountains of Glacier View, which rise mantled in white with the first snows of the year. For him, it’s home. Tomorrow I’m planning on driving out after work towards the Matanuska Peak trailhead north of Anchorage for a two-day backpacking trip up Lazy Mountain with a group of friends. If all goes well, photo-journaling of the adventures shall ensue again next week. I feel a little less apprehension about heading out into cold, steep and rocky places, but I think it has more to do with the companionship than with my preparedness. I always chunk the same well-worn gear into the same ramshackle backpack, pack the same chow and hope the same hopes. May my toes not get too cold. May my photos be outstanding. May I offer a better kind of friendship than the last time. And may the adventures be worth writing about.